A dementia diagnosis is upsetting, but it helps to remember the prognosis is different for everyone. While dementia does progress through stages, there are many things you and your aging loved one can do to slow it down and even halt the cognitive changes associated with the disease. Smoking and excessive alcohol use are two habits that are bad for a person’s body in general, but they can have devastating effects on a senior with dementia because they restrict the amount of oxygenated blood that reaches the brain. If your loved one engages in these activities, help him or her find support to quit or at least limit the use of tobacco and alcohol. Often, just staying busy or spending time with a caregiver helps seniors drop these types of habits and slow the progression of dementia. Exercise strengthens muscles and helps with weight management, but it also gets the blood pumping throughout the body, which delivers oxygen to the brain and reduces the risk of cardiovascular disease that also affects dementia symptoms. Ideally, your loved one should be getting at least 30 minutes of physical activity a day. If your loved one has difficulty sticking with an exercise routine, a professional caregiver can be a wonderful resource. Huntsville senior care experts are available to provide high-quality care to seniors on an as-needed basis. From assistance with mobility and exercise to providing transportation to the doctor’s office and social events, there are a variety of ways professional caregivers can help your aging loved one continue to live independently. Your loved one needs to start thinking of the brain as being one of the most important muscles in the body. Many of the worst dementia symptoms, such as memory loss and confusion, can easily be addressed through fun and enjoyable activities. Whether your loved one enjoys doing crosswords or prefers to do online brain training games, keeping the mind engaged is critical for long-term wellbeing. As you plan brain-boosting activities, make sure to include things your loved one has never done before. Trying to figure out how to solve a new problem or learn a new skill also activates critical areas in the brain that help with memory retention and problem-solving. Traumatic brain injuries are more common in seniors who experience a fall or major blow to the head. However, these are associated with cognitive changes similar to those related to dementia, and all it takes is one bad accident to cause dementia symptoms to progress to the next level. Make sure to provide the assistance your loved one needs around the house to prevent slip-and-fall accidents that could lead to further deterioration in the brain. If your loved one has mobility issues that increase the risk of falling, you may want to consider having a caregiver in the home at all times. Certain age-related conditions can make it more challenging for seniors to age in place safely and comfortably, but Huntsville live-in care experts are available around the clock to help seniors manage their health. Whether your loved one is living with dementia or is recovering from a stroke, you can trust the professional live-in caregivers from Home Care Assistance to enhance his or her quality of life. 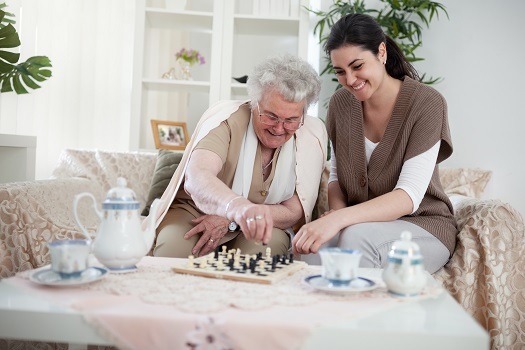 Socialization is often overlooked when it comes to slowing the progression of dementia. However, seniors with strong social ties tend to fare better when it comes to retaining their cognitive abilities. Seniors are more likely to follow a treatment plan when they know they matter to others, and simply talking to friends and family members strengthens memory retention and language abilities. Aging in place can be challenging for seniors with dementia, and slowing its progression can increase quality of life tremendously. If your senior loved one needs help managing an illness or assistance with daily tasks, make sure you choose a top-rated provider of home care. Huntsville Home Care Assistance is here to help your loved one live a happier and healthier life in the golden years. From the mentally stimulating activities in our Cognitive Therapeutics Method to our friendly Care Managers who are available to answer your questions 24 hours a day, we offer a wide array of high-quality at-home care services. Home Care Assistance will work with you to customize a care plan that’s just right for your loved one’s needs. Call us today at (256) 716-9940 to discuss how we can give you the peace of mind that comes from knowing your loved one is being cared for with professionalism and compassion.